The total franchise package costs £50,000 but banks will normally fund up to 70% so franchisees need to only find £15,000 to invest. Buying into a franchise at just 25 can be daunting, but Philip Edwards of Newbury, Berks, is enthusiastic about his opportunity. 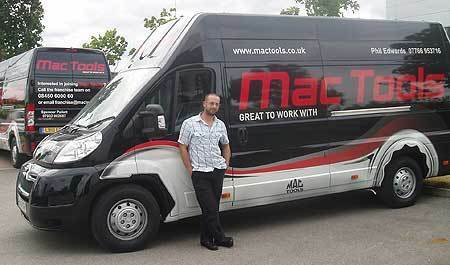 He took over his local Mac Tools franchise in July. After weighing up all the pros and cons I decided that Id be gutted if I didnt go for it and give it a try, Philip says. My parents had reservations as Im young, but they agreed Id regret it if I didnt do it. Luckily, he had a good first day and sold £250 worth of tools. Since then, he hasnt looked back. My future prospects have improved dramatically and I have ample opportunities to develop the business, he says. Because Im young I do come across the odd older garage owner or mechanic who questions my abilities, but you do find quite a lot of young people working in garages so Im not that unusual. He was given full training by Mac Tools which is part of the global Stanley Works Group that employs 15,000 people across the world. After a week of basic training in Sheffield, he attended an intensive two-week training course in the States, including a graduation ceremony, before returning to Sheffield for some more fine-tuning. And since starting up in business the support has been excellent, according to Philip. Its great to be part of such a forward-thinking, friendly and supportive company that has an excellent reputation, he says. The company provides a tool delivery service to the automotive industry. Franchisees are van-based and they run their business from home.